Yesterday I had a nice adventure that turned out very well for all of us here who want puppies again soon! Our Riley is now two years old, which is the magic age for getting her hip and elbow clearances for breeding. Barb and I co-own Riley with Sydney Waller our mentor, and Donna Talbot a breeding colleague and close friend. 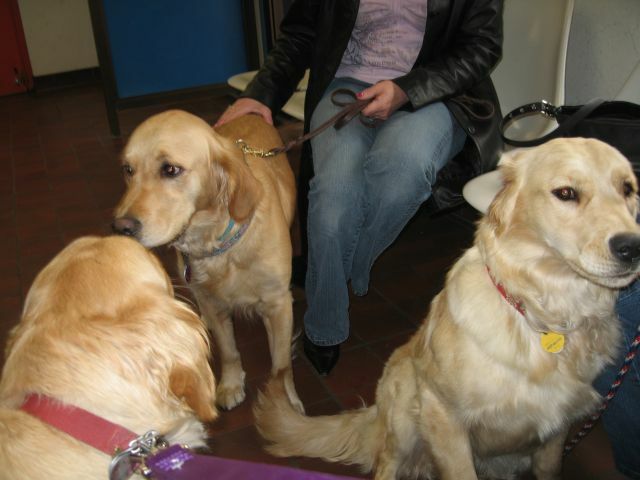 We took Riley along with her sister Ebby that Donna and Sdyney own, and a cousin golden, Haley, that Sydney owns, to get their hips checked. 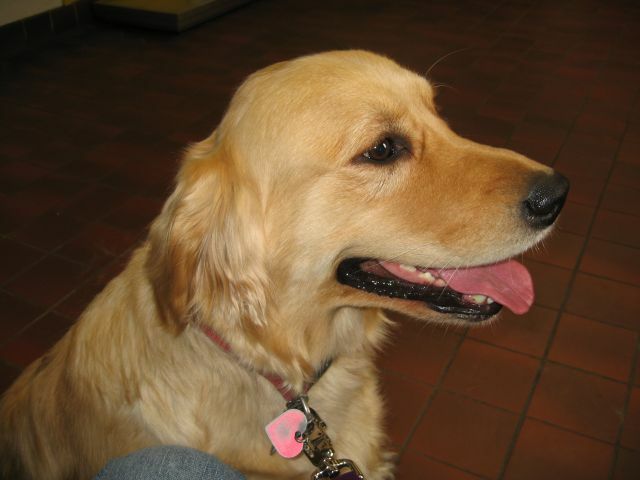 There is a special vet in Warren Rhode Island that Sydney has used for years. 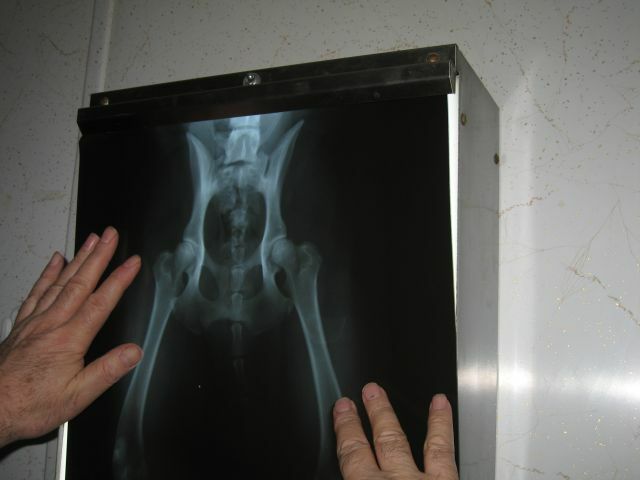 He is able to get good XRays without the use of anesthesia which is what most vets do. The purpose of the films is to weed out those dogs that might be carriers of whatever genes express hip dysplasia. Dogs with unacceptable scores will not be allowed to be bred if you are a responsible breeder. This test should then theorectically decrease the incidence of this undesirable finding in dogs of large breeds. Happily Dr. Mello, thought that all three dogs would have no problem passing their OFA’s. So we had a pleasant and happy ride home. At least we won’t be on pins and needles awaiting the scores. This is the last clearance test for both Riley and Ebby and then we will have two moms to be waiting for their next heat and their chosen male companions. Both Riley and Ebby are offspring of our original Abby. When you get together with breeders and discuss lineage lines, it quickly gets complicated and mind boggling sorting out who is related to who and where different parts of your line came from. Thankfully, there is now a computer program that helps you do that. Before we left Rhode Island we plugged Riley and Ebby into the Linneage Manager software and came up with several potential males in the New England area that would complement the size, color, bone structure, and personality that we are trying to achieve with our breeding. If you look at the faces of Riley, Ebby, and Haley, you can see they are very similar due to their parentage.